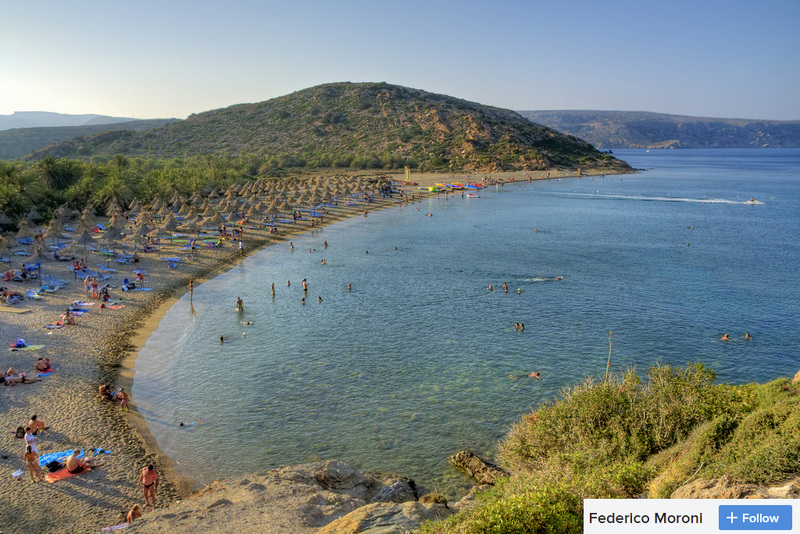 A guide to some of the best beaches that the sun drenched island of Crete has to offer. 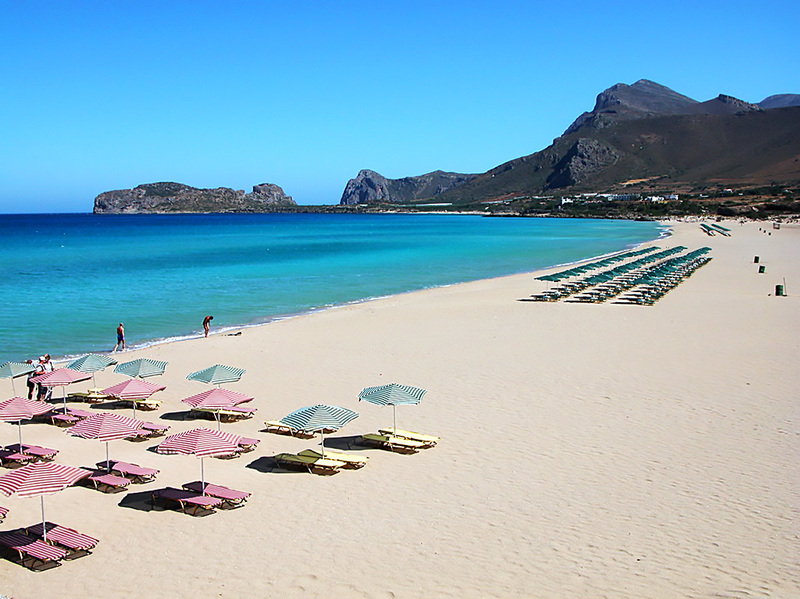 It has to be Balos beach on the west side of Crete. 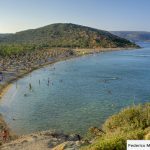 It sits west of Chania and can be reached by either hiring a car, taking an organised trip with your holiday company or from any number of organised boat trips that run throughout the summer from the port of Kissamos for around 25 euros. The island and beaches are amazing, with crystal clear blue waters and white sandy beaches it does get very busy in the height of summer but its worth it for the views and the pictures you will get. An interesting point about this wonderful area is the island you see in the picture actually has a Venetian fortress built atop it, this was to purge and then protect the island from the Turkish invaders, and was one of the first areas in Crete to get rid of the invaders in 1825. Vai is a famous Crete beach and known throughout Europe for being where they filmed those old Bounty chocolate adverts of the 80’s and 90s. It’s the only indigenous wild date palm grove in Greece, and they line the beach creating a very tropical paradise with golden sand being lapped by the clear blue sea. It is said that Via beach and the date palm forest that now exists there came about by Phoenician merchants when passing by threw away the seeds of the dates they ate, they eventually washed up onshore and grew into the forest that’s there today. 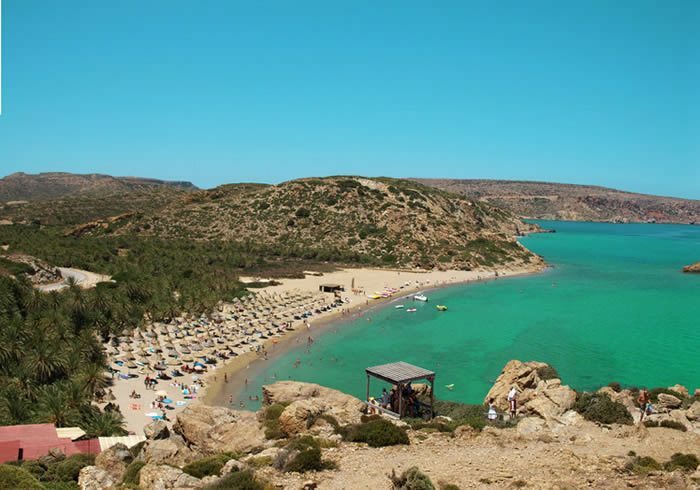 For those wanting to get to Vai you will find it around 94km from Agios Nikoloas and 25km east of Sitia and there are regular excursions to the beach which can be bought from your holiday representative or through local Cretan travel agents. There are quite a few snack bars and cafes on the beach so you wont go hungry, you can hire a couple of sunbeds and an umbrella and either chill out and relax or go snorkelling or use the water sports they also provide there for an additional cost. A wonderful 1km stretch of beach on the southwest coast, well two combined beaches anyway and you can take your pick from the sandy Pahiá Ámmos beach on the west side or the quieter pebble beach of Halikiá on the eastern side. If you are on this side of the island its around a 90 minute drive from Chania which sits around 75km away, and the same on any of the public buses. 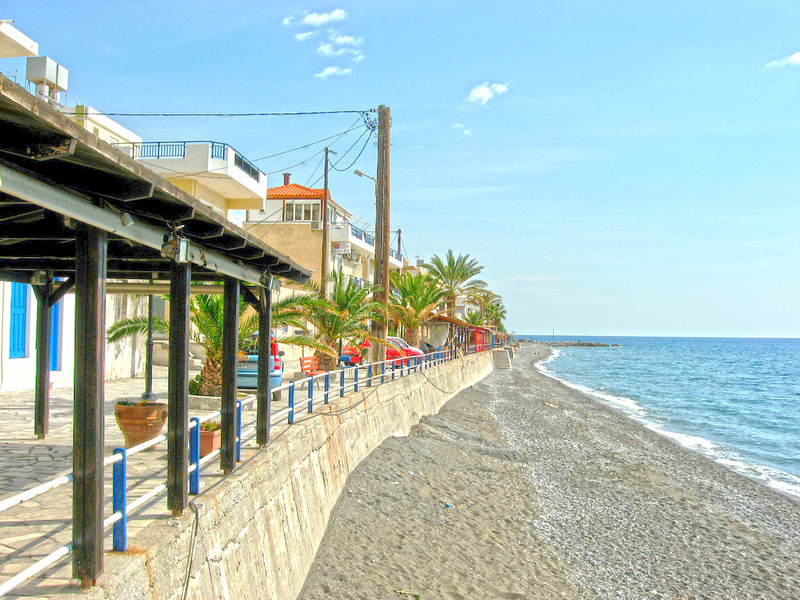 The area has plenty of beach side Tavernas, cafes and fast food places to eat. If you have never had a gyros before then try them here, only a couple of euros and you will remember the taste forever. This beach is popular with windsurfers due to the winds that can pick up in the bay area, so if you’re feeling adventurous why not give it a try? For a more relaxing time you can always grab your snorkel and flippers and take a leisurely swim around. 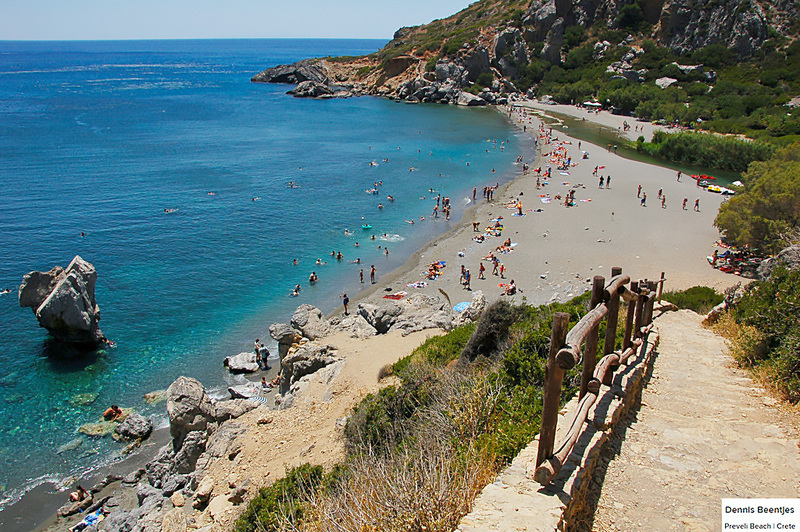 This is probably one of our favourite Crete beaches and we find ourselves back here year after year. 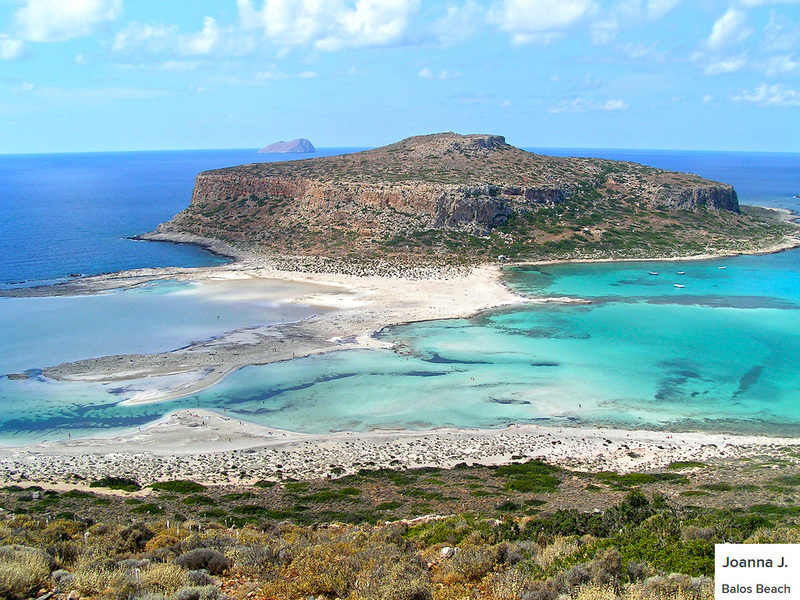 It is actually a small islet connected to mainland Crete by a shallow reef. You can get to the islet when the sea is calm but we always advise wearing suitable foot wear. Elafonisi beach is around a 80 minute drive from Chania but again you will find they do regular boat trips here from Kissamos port. 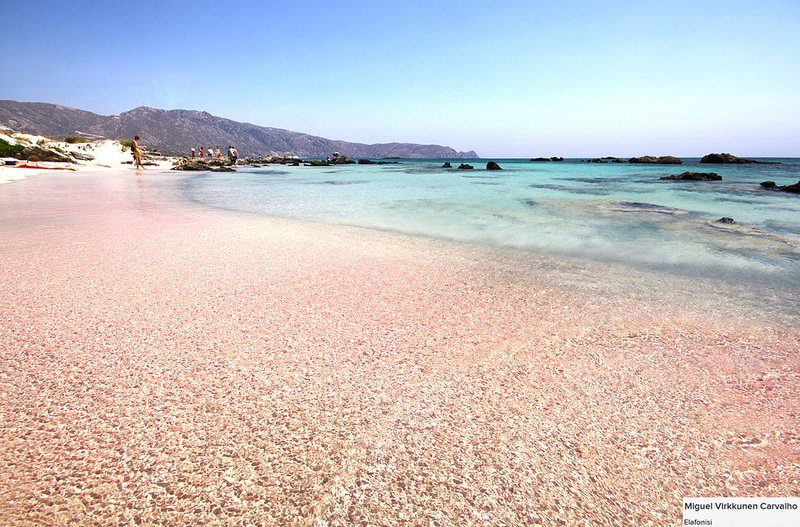 What makes Elafonisi beach so nice is the pink sands and crystal clear blue waters. The pink sand has come from the red and pink shells on the coral reef that have been ground up by the seas and has gradually built up over the centuries. There are a few cafes and fast food outlets here with sunbeds on the main beach ready for hire with umbrellas. You will also find normal toilet facilities and changing areas. 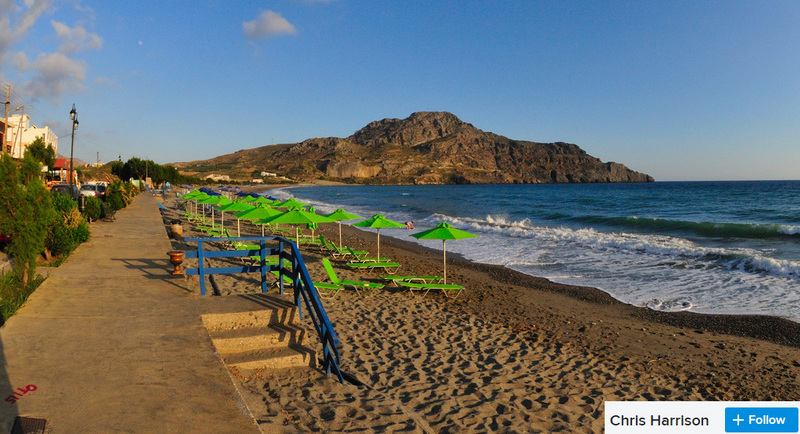 One of the most picturesque Top 10 Crete beaches sits in the area of Rethymnon and the beach sits around 40km from the town of Preveli. 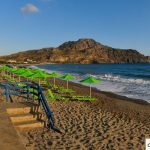 You can get to the beach of Preveli by parking up near Preveli Monastery or by one of the many boat trip excursions that sail from Plakias or Agia Galini. Preveli beach is pretty unique in Crete, with a large river called Kourtaliotis River ending up here, it’s surrounded by lush green vegetation, palm trees and the like. The white sands draw visitors from all over the island and for those that like something different and a bit of a hike its the perfect place to explore. Because of its natural beauty and its a popular beach in Crete it does get very busy in the height of summer, you will always find a sunbed but try and get there early for the best sports, or take your own towels and just lie on the waters edge and have the crystal clear waters lapping at your feet. Myrtos beaches lays at the base of Mt Díkti’s foothills and offers a kilometre of fine-pebble and shingle beach. 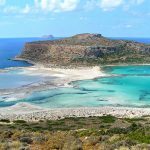 You can grab the local buses from Ierapetra which run daily through the week and a couple of times at the weekend or grab a car and drive down. Myrtos beach is a lovely little beach, not too overcrowded now, and the sunbeds here are refreshingly free of charge, normally laid on by the Tavernas that line part of the beach in the hope that you frequent their restaurant. And to be honest why wouldn’t you? The food here is top class and the service is impeccable. As for what to do on Myrtos beach then really its just sunbathing with a spot of snorkelling. Or for the more adventurous you can grab a kayak from the local water sports company that operators on Myrtos. The famous Matala beach, still known across Crete for its association with the hippy movement in the 70s and 80s, although most beaches including Via and Myrtos has a large population of hippies around that time it was Matala where the image of them stuck more than any. 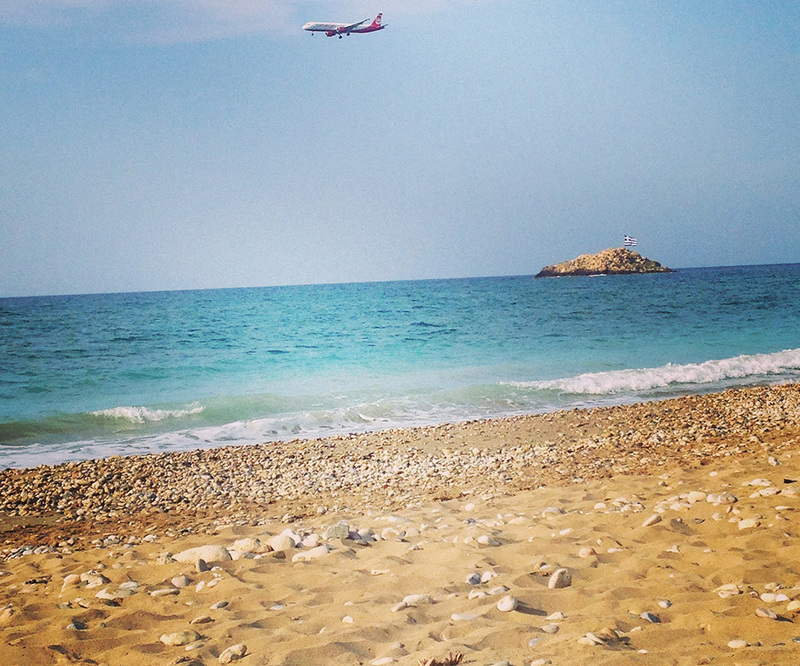 Matala beach is always busy throughout the summer months, but you will always find a space to sunbathe. 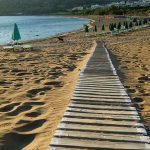 The beach itself is around 300m long and there is normally a good set of bamboo umbrellas and sunbeds offered for small fee by the owners of the Tavernas. Matala is covered more in our guides but the beach is flanked by some caves, once inhabited in pre-historic times, more recently by the hippy communes and now either free for you to roam or fenced off for preservation. Back to the beach you will also find water sports available to enjoy for small local charge. 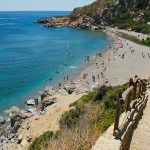 You will find the fine sandy beach of Plakias around 40km from the town of Rethymnon, around a 30 minute drive or bus trip. 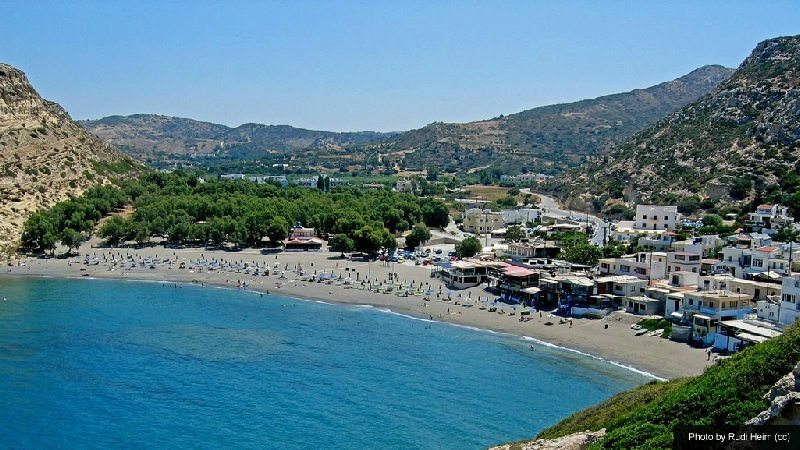 Of course Plakias is a lovely holiday town by itself, so if you book a holiday here you get to enjoy this lovely beach on your doorstep. Just like the other beaches you will find an organised assortment of areas set out with sunbeds and umbrellas. These are normally served by the beach side cafe bars and Tavernas where you will find a relatively inexpensive snack or lunch. 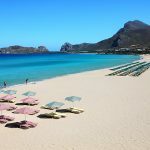 As the other Crete beaches water sports are available for a small charge, and operate most days. 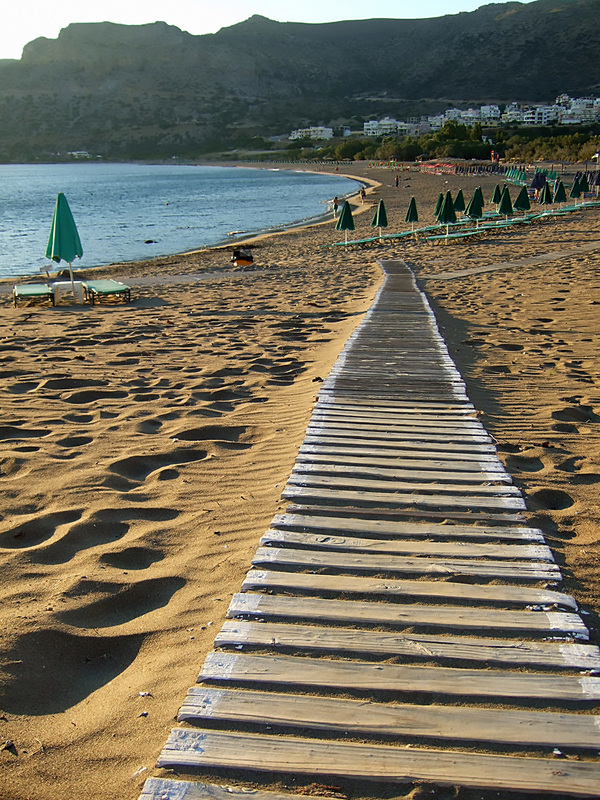 Not all Crete beaches are organised with sunbeds, umbrellas and a multitude of cafes and tavernas. Some like Tymbaki beach just past Heraklion airport stretch for miles and and almost deserted. Why deserted? Well there have been a few small hotels there and some studios and pensions exist around the area but it has never taken off as a big tourist area. Which is to the benefit of the locals and holidaymakers looking to getaway from the crowds alike. This beach is a fine sandy beach with plenty of fishing and snorkeling opportunities if you are near the rocks and due to its exposed location is the perfect place for windsurfers and surfers if the waves get high enough. 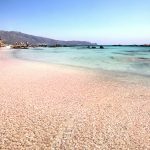 Falassarna beach is not far from the town of Kissamos and 58km from Chania and has won prizes for its cleanliness and its crystal clear waters. The beaches stretch that far in both directions that you are never too overcrowded like some of the more popular beaches we have mentioned in this article. This is another of the exposed Crete beaches that gets quite a bit of wind, but makes it a very popular choice for windsurfers and surfers alike. You can choose to go on the local water sports like the doughnut rides or jet skis. There are of course plenty of facilities on the beach including cafes, fast food shacks, tavernas with toilets and changing facilities. 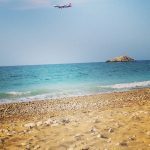 If you have any extra photos of our 10 favourite Crete beaches please feel free to contact us and submit them and we will add them on to help other new travellers to Crete choose their favourite beach.